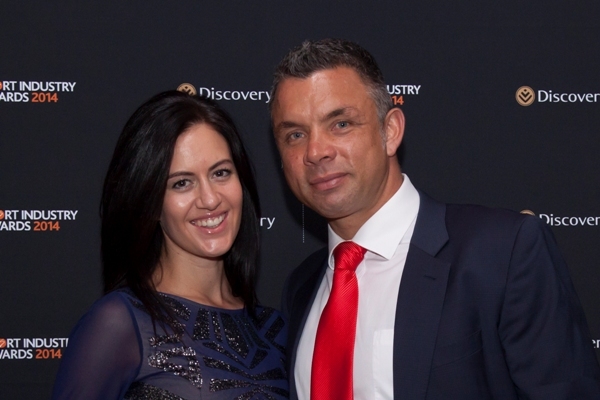 See who took top honours at the The annual Discovery Sports Industry Awards. It was that time of the year when the people from the sport fraternity got together to celebrate the great work done by people working behind the scenes and the companies that support the sport industry. The annual Discovery Sports Industry Awards were held at the Sandton Convention Center and was attended by 1 200 guests, from sports stars to company execs and models. Mark Boucher was honored with the Deloitte Outstanding Contribution to South African Sport award. The former cricketer who was forced to take an early retirement from cricket after an eye injury last year was handed his trophy at the glamorous red carpet event. Other winners at the event were Telkom - Jomo Sono’s wedding for the TV Sport Commercial of the Year, Dr Ali Bacher who received the Castle Lager Lifetime Achievement award and Lucas Sithole for the Discovery Peak Performance Moment of the Year for the Paralympian’s win at the Quad Grand Slam last year, beating world number one, David Wagner and making him the first African to win it. 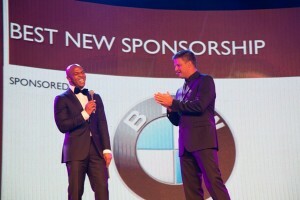 Quinton Fortune and Host Bob Skinstad share a laugh.